Expressing his condolences in a telegramme, Pope Francis says the late-Cardinal Miguel Obando Bravo gave his life to the service of God and the Church. “I offer prayers for the eternal repose of his soul, so that the Lord Jesus may grant him the crown of unfading glory,” said Pope Francis. With his death, the College of Cardinals is composed of 212 Cardinals, 115 of whom are Cardinal-electors and 97 non-electors. 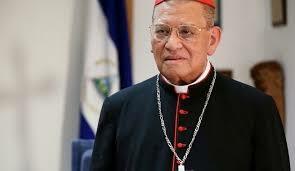 Biography of Cardinal Miguel Obando Bravo: Cardinal Miguel Obando Bravo, S.D.B., Archbishop emeritus of Managua (Nicaragua), was born on 2 February 1926 in La Libertad, Nicaragua, in the actual diocese of Juigalpa. After having attended the Salesian College of Granada he obtained a baccalaureate in Latin and Greek; in San Salvador he received a doctorate in mathematics, physics and philosophy. After entering the Salesians he studied theology in Guatemala and thereafter vocational psychology in Colombia, in Venezuela and in Rome. He was ordained a priest on 10 August 1958 and was professor of mathematics and physics in the superior schools of Nicaragua and El Salvador; Prefect of discipline of the Salesian seminary of San Salvador (1959); Rector of the Rinaldi Institute; Member of the provincial council for Central America of the Congregation (1962); Delegate for Central America and Panama at the XIX General Chapter of the Salesians which was held in Rome in 1965. Nominated by Paul VI titular bishop of Puzia di Bizacena and Auxiliary of Matagalpa (Nicaragua) on 18 January 1968, he received episcopal ordination on 31 March1968. During this period in Matagalpa, he dedicated particular pastoral attention to the campesinos and to their urgent problems. On 16 February 1970 he was nominated Archbishop of Managua, taking possession of the archdiocese on 4 April 1970. He was delegate of the Nicaraguan Bishops for the General Assembly of the Synod of 1971; President of the Nicaraguan Bishops’ Conference for 6 different terms from 1971-1997 and then again in 1999; President of the Bishops’ Secretariat of Central America and Panama from 1976-1980; President of the Department for Religious of the Latin American Bishops’ Conference from 1981 to 1985. Many international organizations have given him prestigious recognition for his uninterrupted pastoral and humanitarian work. President of the Bishops’ Conference of Nicaragua, December 1999 - November 2005. Archbishop emeritus of Managua, 1 April 2005. He participated in the conclave of April 2005, which elected Pope Benedict XVI. Created and proclaimed Cardinal by St. John Paul II in the Consistory of 25 May 1985, of theTitle of St. John the Evangelist a Spinaceto.